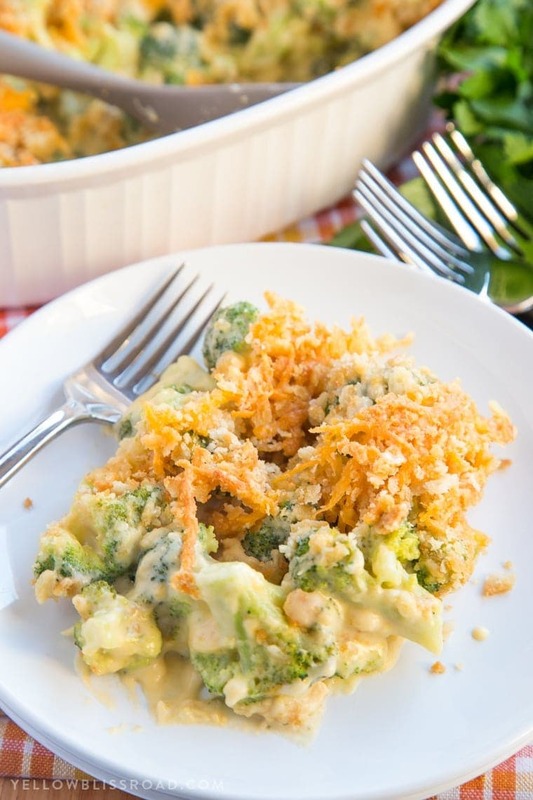 This Cheesy Broccoli Casserole has tender broccoli smothered in a rich and creamy cheddar cheese sauce, topped with crushed butter crackers. This is one Thanksgiving side dish that is sure to please them all! When I was a kid, smothered in cheese sauce is literally the only way I would eat broccoli. I’m pretty sure that what actually ended up in my mouth was way more cheese than broccoli. I’m pretty sure if the words broccoli casserole ever crossed my mother’s lips, I’d run from the table. My kids aren’t fans of cooked broccoli either, and I realized that I had never showed them my mom’s method to get me to eat it. With Thanksgiving coming up, it’s a perfect time to be sharing casseroles and hearty sides like this one. 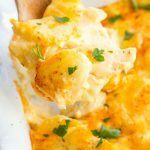 My Broccoli Cheese Casserole is full of cheesy goodness with a crispy crunchy topping that people go nuts for. I have to refrain myself from picking off that yummy topping while I’m waiting for the rest of dinner to be ready! How Do You Make Broccoli Casserole? This Broccoli Cheese Casserole couldn’t be easier to make. The broccoli is blanched in boiling water for a few minutes to get the cooking process started, then smothered in a creamy cheese sauce. 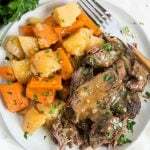 The sauce is just a roux of flour, butter and milk (or half & half) and cheddar cheese. Finally the topping is just crushed up butter crackers (like Ritz) and melted butter with a little more shredded cheddar thrown in for good measure. Because you can’t have too much cheese in a broccoli casserole. 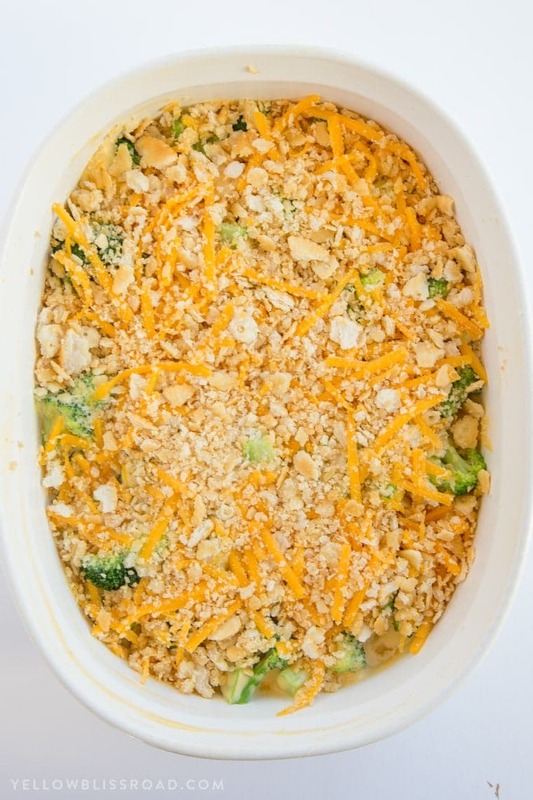 Toss the broccoli with the cheese sauce, top it with the crushed crackers and bake in the oven for about 20 minutes. The top will get nice and golden and the cheese sauce will be bubbling up on the side and it will look and smell amazing. That’s how you know it’s finished! PRO TIP: Broccoli has a pretty strong flavor on it’s own, so a bunch of seasonings and spices aren’t necessary. Add a little garlic powder or paprika to the cheese sauce to kick it up a little and call it good. Can a Broccoli Cheese Casserole be Frozen? Absolutely! 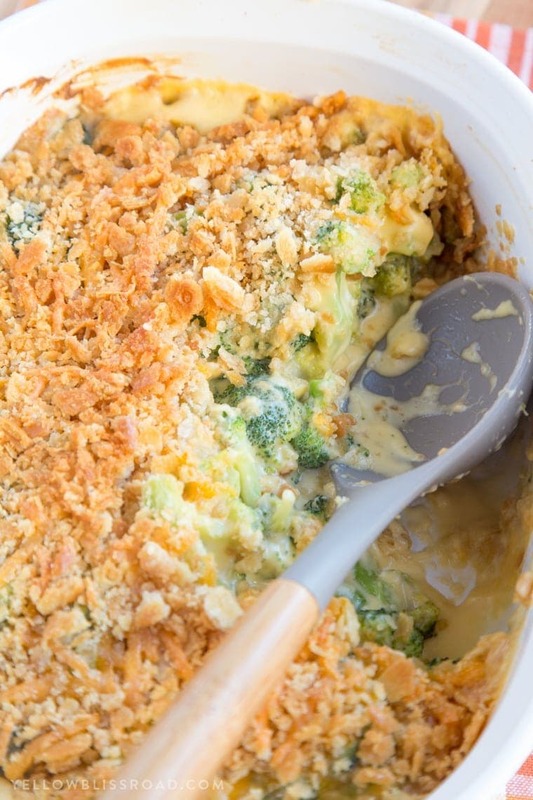 Here are some tips for freezing your broccoli casserole. Bake the casserole and let it cool completely. Putting a warm casserole in the freezer will encourage condensation to form inside the dish resulting in a soggy and inedible mess when thawing. Cover tightly. Wrap the cooled dish with plastic wrap, then tightly with foil. You could even slide the dish into a freezer zip-top bag for an extra layer of protection. To thaw, place in the refrigerator overnight. Bake the thawed, uncovered broccoli casserole in a 350 degree oven for 20 minutes, or until it’s hot in the center. If it needs longer and starts to get too brown on top, cover it with foil and continue baking. 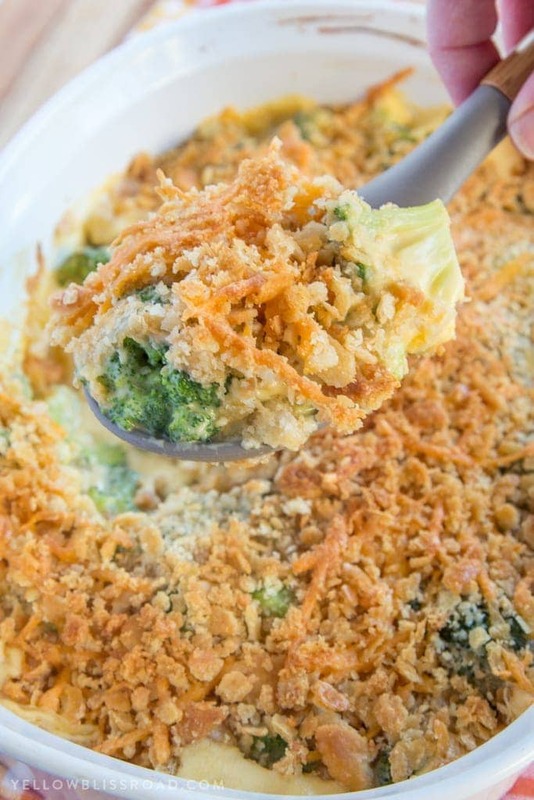 Everybody loves this delicious broccoli casserole, and I bet your family will too! Preheat the oven to 350 degrees F. Spray a medium sized rectangle baking dish (about 11x7) with cooking spray and set aside. Bring a large pot of water to boil. Add broccoli and boil for 3-4 minutes. Drain and set aside. In a medium saucepan, melt butter over medium heat. Whisk in flour, garlic powder and paprika and cook for several minutes until golden. Add half & half and bring to a simmer until thickened. Remove from heat and stir in cheese (reserve 1/4 cup for topping). Stir in salt and black pepper. Taste and add salt as desired. Arrange broccoli in the baking dish. Pour cheese sauce over the broccoli and gently stir to coat. In a small bowl, combine crushed crackers with melted butter and stir in the remaining cheese. Sprinkle cracker mixture evenly over the casserole. Bake uncovered at 350 degrees for about 20-25 minutes, or until sauce is bubbly and topping is browned. If topping isn't browned enough, place under the broiler for a few minutes. To freeze, bake and cool casserole completely, then cover tightly with plastic wrap and foil. Thaw in the refrigerator, then bake as directed in step 6. 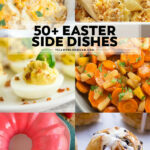 For all side dishes go HERE and for the Recipe Index go HERE. So glad you enjoyed it Sivetta! butter is in the recipe 2 times. Is that correct or a typo?? The first quarter cup is for making the cheese sauce. The second mention is melted, and is for the butter cracker topping. Can i make it all up and then throw it in the fridge and then cook it? Because you make a cheese sauce, you want to bake it right away or the sauce could thicken and not be any good. What about cooking a little earlier (a couple hours max) and then re-heating? or would that wreck the sauce? I would worry about the sauce separating. This one is best served immediately. The third ingredient in the list is 1/4 butter. I’m going to hope it’s 1/4 cup and cross my fingers. Yes it’s 1/4 cup. I’ll edit that, thanks! Would this be able to be made in a crock pot? I want to make it for Thanksgiving, but I’m not sure if I will have the oven space! I have not tried this in a crockpot. I’m always nervous with cheese in a slow cooker and you definitely wouldn’t get the crisp topping. Do you know what the nutritional value is? Roughly 350 calories in a serving. There are about 8 servings in a pan. 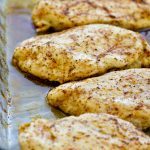 If you add cooked chicken and rice and more cheese this can be a real good recipe . I’m male and do a lot of cooking . Can I use frozen broccoli? Frozen broccoli would add unnecessary liquid to this recipe. I would thaw it first, and let any liquid drain off. What size baking dish should I use? 9×13? More like 11×7. I updated the instructions to state that. Sorry for the confusion! 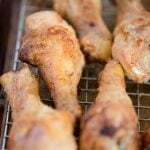 can yoy use self rising flour? I haven’t ever used self rising flour for a roux, and I’m not sure it would work quite right because of the leavening agents. delicious!!!! 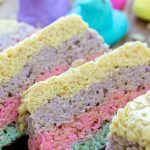 we were looking for a broccoli casserole that doesn’t have mayo in the recipe and wow!! this is better than any casserole I’ve had with mayo before. thank God I was able to find this recipe for this thanksgiving, definitely a staple now. So glad you enjoyed this! Can this be made the day ahead? Hi! 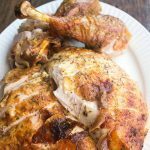 i just wanted to let you know that I featured this recipe on my post about Thanksgiving Recipes (mixandmake.com/2017/11/17/easy-thanksgiving-recipes/). 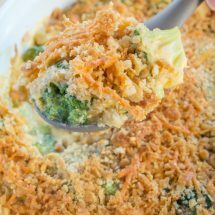 We broccoli casserole is one of my family’s favorite dishes- Thanks so much for posting this recipe! 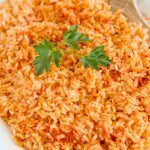 Have you ever made this with rice? I am looking for a good cheesy, broccoli rice casserole! The cheese sauce had a pasty texture. Sounds like the sauce broke because it was cooked for too long. Was the cheese sauce by o be thick ?